Happiness comes from being part of something bigger than ourselves. 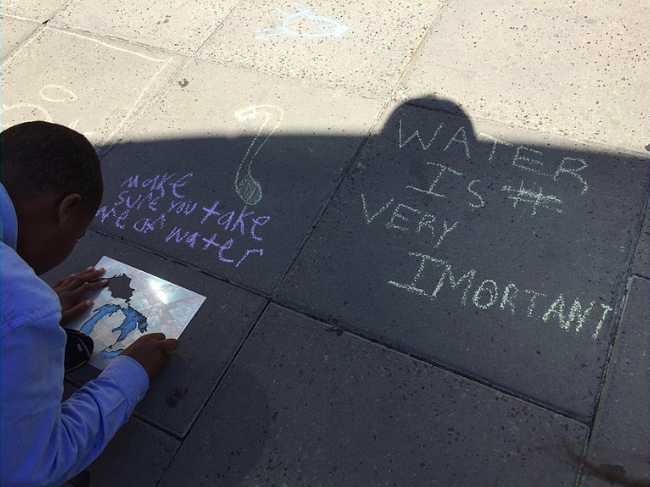 TEENS H2O, a project supported by the Chicago Learning Exchange, connects Chicago students to all that is water: Where is our freshwater? How do we know our water is healthy? and What can we do to protect our water? We want to engage students as citizen scientists, without them thinking they have to be hydrologists. We mention and they think about science, art, and design careers in the workshops as well. As citizens, they can do water testing and contribute to the health of water resources. TEENS H20 Water Workshops, which take place along and on the water, challenge students to understand water issues and to become citizen scientists and ambassadors of water issues with their families and friends. Teens H2O addresses the need for outside-of-the-classroom learning that allows the students to look at their everyday environment through a fresh lens. Water Workshops address the need for play-based and hands-on learning allowing students to be their own teachers through the process of creating projects and sharing information. Projects explore the topics of Architecture, Design, Science, Civic Engagement, Engineering, STEAM, Local History, and Literacy and focus on the role of the Great Lakes and the Chicago River in public health. Students use existing and new technologies to develop projects that communicate a change in perceptions and policy of protecting fresh water. Students check to see if their water is clean and safe to drink. As citizen scientists, they experience the river, the Great Lakes and the watershed as part of a connected body with the oceans. They also think about how a city should be working to manage stormwater and to best filter water sources. Teens become clean water agents connecting with adults who work in water and share what they know with their families and peers. Check out one of the videos created as a part of the project below. To check out other Chicago Learning Exchange-funded projects, click here.